The parking sensor display included in the system is a great addition to any car, not only do you get the audio feedback (beeping) that our speaker systems provide but the display will interpret those sounds into lights on the display bar, each side of that bar represents a side of your vehicle and makes it much more enjoyable you park and back up. These systems come in 4 or 8 sensor bundles depending on if you want to cover both the front and the back of your vehicle. We have 5 types of displays to fit everyone’s needs. To choose the display please click the menu on the top right of this page. 1. Standard Display-This is our entry level display with sound, it will work with our 4-8 sensor systems and will display lights and numbers in addition to beeping while you are backing up. 2. Slim Display- The slim display is very popular because it has all the features that the standard display has but its 50% slimmer and significantly brighter than its less expensive cousin. It very easy to mount above your mirror and its slim build makes it unnoticeable. 3. Brighter Display- The brighter display makes it work perfectly in direct sunlight but auto dims at night. It has 100s of LED and as you get closer to whatever you're backing up into it will give you a very detailed Interpretation of what’s behind you, in addition, it still has the premium sound and numerical display that our other displays and speakers have. 4. 2.5-Inch Detailed Display (SKU5919467) - This LCD Display Dual Parking Backup Sensor System with Sound will show you an image of a generic car and will Interpret what’s is in front or behind you on the image of the car. The screen has a 2.5 viewable area and will work flawlessly in day or night. This sensor system can come with 4 or 8 sensors. 5. 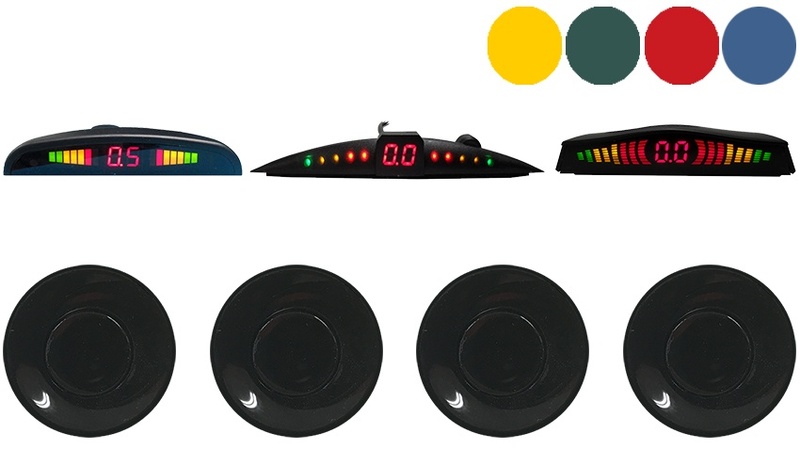 Clip-on Mirror Display (SKU4775541) - This Color Mirror Dual Parking Backup Sensor System with Sound is a popular parking sensor system because it’s a clip-on mirror with embedded LEDs that will do everything that our slim display does. But it will clip over your existing mirror and will look stock in the vehicle. The mirror itself is made of very high quality and will look like a regular mirror even when the sensor system isn’t activated. 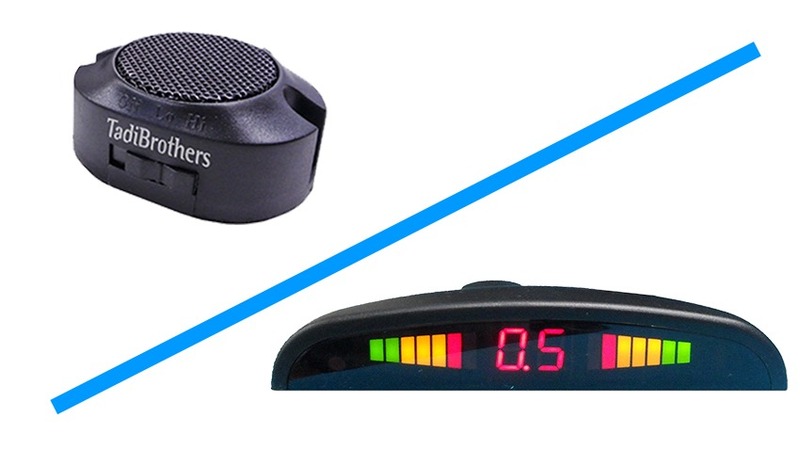 With any of the above displays when you put your vehicle in reverse the speaker will start to beep when there is an object 8ft away and the closer you get to the object the beeping will get faster and faster until it “flatlines” 6-inches away from your bumper with a solid beep. The TadiBrothers radar technology had been used on the road for over 10 years from a small Ford Focus to large semi-trailers, we keep everyone safe. When designing these displays we had the esthetics of your vehicle in mind, we made it elegant enough that you can display it anywhere in your vehicle some customers have even velcroed it above their mirror to make it more intuitive for users. Please note, all of the above choices can be picked in our “customize and upgrade” section located at the top right of the page. for even more information please click here to read our parking sensor guide. This system includes enough cable for even the longest SUVs. Very easy to install and it comes with everything needed including the appropriate hole saw to make the perfect hole. All of our products come with a Standard 1-year warranty.